A train wreck on the water? 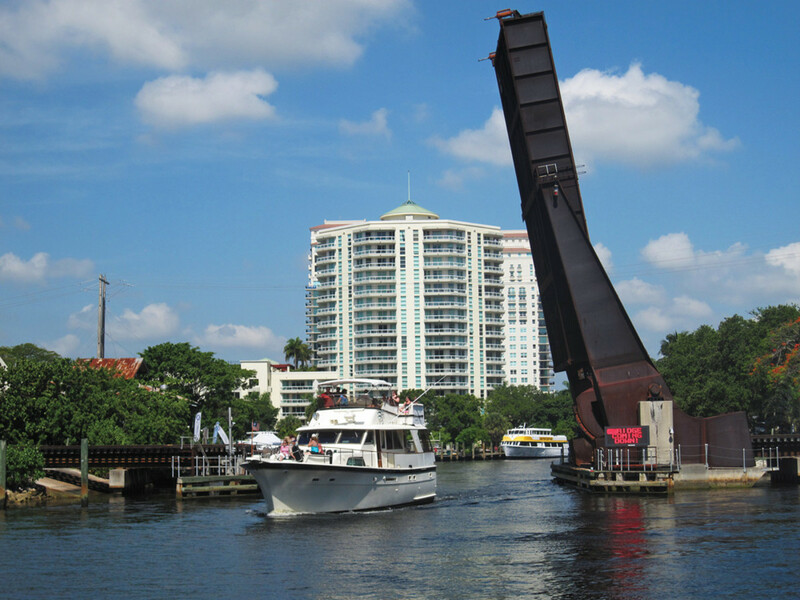 South Florida marine businesses and pleasure boaters are vehemently opposed to a passenger train expansion that would keep rail bridges such as this one on the New River closed - and impassable - much more often. Opposition to All Aboard Florida continues to mount after the release of a draft environmental impact statement that critics say is deeply flawed in its assessment of the threat 32 high-speed passenger trains a day would pose to safe navigation and marine businesses upriver of three railroad drawbridges which — when closed for a train — tie up the boat traffic that is the lifeblood of South Florida’s marine economy. The environmental impact statement, compiled by consultants hired by All Aboard Florida, was released in September. It says that with mitigation, the proposed rail service from Miami to Orlando International Airport, with intermediate stops in Fort Lauderdale and West Palm Beach, will have “no adverse economic impact” on marine jobs, economic growth or development along its 168-mile route on Florida’s east coast. Hogwash. At least that’s the way Jimmy Harrison, owner of Frank & Jimmy’s Prop Shop, sees it from his shop just two blocks from the Florida East Coast Railway bridge over the New River in Fort Lauderdale. An MIASF white paper says the impact statement understates the effect that the $1.5 billion “express” rail service would have on boat traffic at the railroad bridges on the New River in downtown Fort Lauderdale, the Loxahatchee River in Jupiter and the St. Lucie River/Okeechobee Waterway in Stuart. 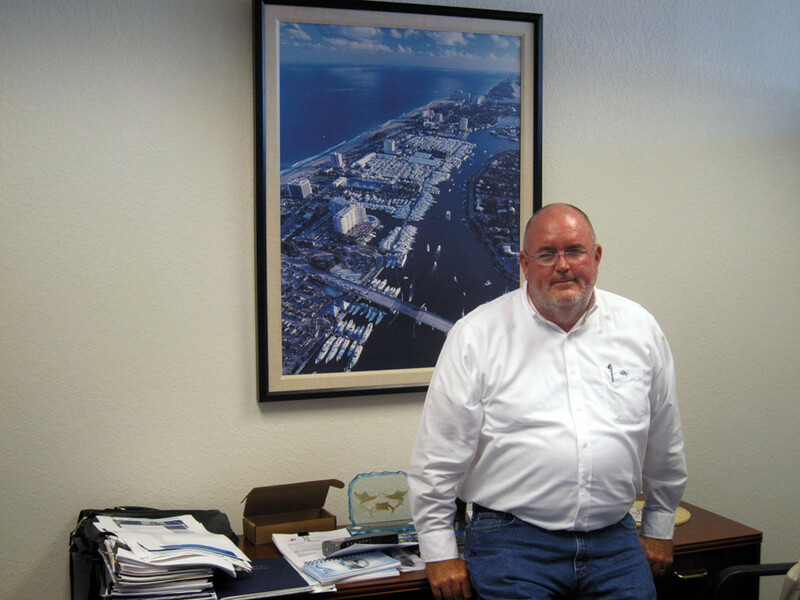 That is unacceptable, says MIASF executive director Phil Purcell, and — despite what the impact statement says — poses a threat to the health of a marine industry that generates $11 billion annually in Dade, Broward and Palm Beach counties. “Running trains over the bridge 30 minutes of every hour is literally not allowing our business access [to the river] 50 percent of the time. That’s intolerable,” he says. The passenger trains will operate at speeds of as much as 79 mph from Miami to West Palm Beach, 110 mph from West Palm Beach to Cocoa, and 125 mph from Cocoa, where the route turns west, to Orlando. The trains will run 128.5 miles on the Florida East Coast Railway corridor from Miami to Cocoa, then about 40 miles on a new east-west rail corridor on a state-owned right-of-way along Route 528 from Cocoa to Orlando. All Aboard Florida proposes to operate hourly service from 6 a.m. to 9 p.m., with 16 trains running in each direction daily — a total of 32 trains a day. That’s probably two an hour crossing the bridges, and that does not include the freight trains from the ports of Miami, Fort Lauderdale, Jacksonville and other port cities that use the FEC tracks. AAF says the service will improve Florida’s railroad infrastructure, remove 3 million vehicles from the roads, revitalize downtown centers in Miami, Fort Lauderdale and West Palm Beach and boost tourism in a state that projects 100 million visitors a year by 2030. It also could leave many boatyards, marinas and private dock owners up the river without the proverbial paddle. “The consensus opinion of the yards [up the New River] is that they are very concerned about the navigability of the river,” says David Reed, the MIASF’s treasurer and publisher of the Triton, a news magazine for yacht captains and crews. Many of the larger yachts — some of them 150 feet and longer — navigate the river with towboats at the bow and stern. When the bridge is down, vertical clearance is just 4 feet. Boat traffic stacked up on either side of the closed bridge fight a current that can run as fast as 3 knots and wind, tides and cascades of storm water that periodically flood out of an outfall and into the milling area on the bridge’s east side. 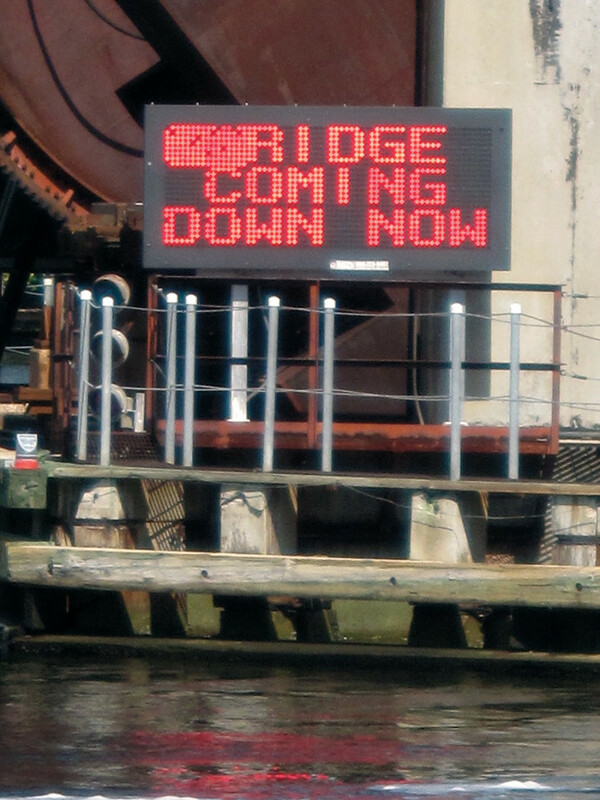 Deep-draft vessels navigating the river are especially vulnerable when the bridge closes for a train. They best navigate upriver at ebb tide when the water is deep enough to handle their draft and they can maneuver better bow-into the outgoing tide. If these larger yachts are delayed by a bridge closing (usually a minimum of 20 minutes) or by an unanticipated bridge breakdown, which can back up traffic for hours, they can get into trouble. A lot of Harrison’s business is the repair or replacement of props damaged on an ebb tide that has drawn too much water out of the channel for a vessel’s draft. Farther north in Stuart, an estimated 88,000 vessels — mostly pleasure boats, but also tugs and barges transiting between the east and west coasts of Florida on the Okeechobee Waterway — pass under the St. Lucie railroad bridge each year, and many of the pleasure boats are from one of the 15 marinas lying upriver from the bridge. As bridge closings multiply, boat traffic on the St. Lucie River could be strangled, says John Sprague, who lives in Stuart and serves on the legislative committee of the Marine Industries Association of Florida. Yachtsmen who keep their boats in Stuart so they can go back and forth between the east and west coasts of the state are liable to just move their boats to the west coast (or decide to get rid of them) if transiting the St. Lucie railroad bridge becomes too onerous. Sprague notes, too, the long-term ramifications of dramatically expanding passenger rail service while the volume of freight on the tracks is increasing, as well, with construction of intermodal transportation centers at ports in Miami, Fort Lauderdale and Palm Beach, and dredging at these ports to accommodate the new super-size Panamax freighters that carry almost triple the number of containers an old Panamax does. He and Purcell say the impact statement must address the carrying capacity of the FEC rail corridor: How much train traffic can it carry before it destroys a marine industry that depends on the waterways beneath the tracks and before it degrades the quality of life in towns and cities along the FEC route to the point that people move away? MIASF executive director Phil Purcell. So why is there no concrete information in the impact statement about how people use their boats and how marine businesses depend on the boat traffic on these rivers to survive? Why doesn’t the statement address these marine industry concerns? Purcell has two fundamental criticisms of the statement. First, its authors did not consult the marine industry, although it is one of the three pillars of the South Florida economy (the others are tourism and real estate). Second, the plan has no real vision. It tries to build a 21st century high-speed railway on 20th century infrastructure. “It’s like taking a 1978 Impala, putting some new parts in it and trying to use it as a commuter car when you can buy a Toyota Prius that can do that job better, more quickly and more efficiently,” Purcell says. He challenges All Aboard Florida to raise the FEC tracks over roads to minimize the effects on the cities its trains will run through; build new, higher railroad bridges over the rivers so they don’t have to close and back up boat traffic every time a passenger train barrels through; and move freight over inland rails owned by other railroads to reduce the schedule of trains on the FEC tracks. “All Aboard Florida needs to invest in its infrastructure so it doesn’t do its neighbors wrong,” Purcell says. It can’t build this “visionary” high-speed train system on the cheap without doing great damage to the marine industry and coastal Florida, he says. Construction of high-speed train stations is underway in Miami and Fort Lauderdale, leading many to believe that All Aboard Florida is a done deal. Purcell doesn’t think so. U.S. Rep. Lois Frankel, the Democratic congresswoman who represents parts of Broward and Palm Beach counties, has asked AAF to “put on the brakes,” slow down and seek answers to these questions before issuing the final impact statement. Florida Gov. Rick Scott was an early supporter of All Aboard Florida. His chief of staff, Adam Hollingsworth, is a former executive of a real estate development subsidiary of the Fortress Investment Group, owner of the Florida East Coast Railway. Scott has said nothing to suggest he has changed his mind. He asked Reininger to address these concerns. U.S. Rep. Bill Posey, a Republican from Brevard County, has asked the Federal Railroad Administration to heed the concerns of counties, municipalities and regional planning authorities along the route. “I believe that the most important thing for the Federal Railway Administration and the U.S. Department of Transportation to do as they consider this issue is to give the greatest weight to the concerns of the local affected communities,” Posey told the railway agency. No fewer than 32 resolutions registering concern about the rail project have been forwarded to that agency by local governments and neighborhood associations, according to Florida Not All Aboard, an organization that has gathered more than 40,000 signatures on a petition calling for All Aboard Florida to build new tracks west of Florida’s coastal towns to realize its goals. Frankel and U.S. Rep. Patrick Murphy, a Democrat representing St. Lucie, Martin and Palm Beach counties, have sent a letter to the Florida Department of Transportation asking that it require All Aboard Florida to work with local governments to seek solutions to their concerns: upgrade rail safety equipment, create “quiet zones” along the tracks, upgrade the railroad bridges, widen the distance between dolphins to allow two-way boat traffic, schedule the trains to mitigate the impact on roads, waterways and emergency services, move freight west to the CSX tracks and provide evidence that the high-speed passenger service is financially viable, which many critics doubt. They also have asked the state to help fund some of those improvements. Although political pressure may slow All Aboard Florida down so key questions can be answered, the Coast Guard holds the key to making sure maritime concerns are addressed. In a frank discussion with the Palm Beach Post’s editorial board, Gene Stratton, chief of marine planning and waterways management for the Seventh Coast Guard District, made it clear that his agency has the final say on South Florida’s navigational needs. The Coast Guard held hearings in October and November, asking mariners to fill out surveys to help determine the “reasonable needs of marine traffic” on those rivers. One very influential voice heard during those hearings was that of Dana A. Goward, a retired Coast Guardsman who was once the nation’s top navigation authority overseeing the permitting and regulation of 18,000 bridges over the nation’s waterways. Now a maritime consultant, Goward studied all three bridges on behalf of Citizens Against Rail Expansion Florida (CAREFL) and found that — in his opinion — none meet the reasonable needs of navigation. The bridges interfere with “a primary economic engine of the local economy” — boating and marine business — and undermine the foundation on which these water‐oriented communities were built. Goward says there are alternatives available to All Aboard Florida: using existing railroad bridges father west; developing a new rail corridor inland (Goward says Florida has been exploring putting in a new rail corridor along U.S. 27 through the center of the state to raise capacity for the region); shipping freight by barge; and replacing the existing bridges with higher ones. If the railroad were to try to permit any of the three bridges today, the requests would be denied, he says. Until the bridges are rebuilt to today’s standards, he recommends that the New River bridge be open 40 minutes every hour and the Loxahatchee and St. Lucie bridges 31 minutes each hour; that after a closing, bridges remain open long enough that all waiting vessels can get through; that single closings be limited to 15 minutes; and that opening times be “highly predictable” and easily understood. Goward believes All Aboard Florida is essentially flawed: “You can’t run this century’s rail operations on last century’s infrastructure,” he says. The state has a “compelling interest” in protecting its citizens from All Aboard Florida’s disruptive effects and should make sure the many concerns about this rail plan are adequately addressed, he says. Goward also knows from experience that the Coast Guard has “a lot of discretion” in balancing maritime transportation and transportation needs. “The public needs to support the Coast Guard in defending the rights of mariners,” he says. The Coast Guard report on its findings was scheduled to come out around year’s end. Purcell says the draft impact statement suffers from a lack of understanding of the marine industry’s size, its scope, how it works and its importance to the region. Marine economist Thomas J. Murray, who authors the MIASF’s economic impact studies, reviewed the statement and found flaws in the methodology its preparers used to estimate the size of the marine industry. He says the statement’s estimate of marine-related economic activity is off by about two-thirds and it ignores marinas and storage facilities in its marine business count. “The EIS misses hundreds of millions of dollars of marine industry economic activity as a result of this naive oversight,” he says. He says, too, that the impact statement’s suggestion that marine activity on the New River represents less than a third of the marine activity in Broward County is an “egregious miscalculation” and fails to take into account how much local marine tradesmen and businesses rely on the river, its marinas, boatyards and boat traffic — megayacht traffic, in particular — to generate revenue. What really aggravates Purcell is that the rail service’s projected economic impact pales beside the impact the marine industry already has in South Florida, yet All Aboard Florida is willing to jeopardize that gold mine so it can pursue a plan that many doubt will ever pan out. Florida East Coast Industries, AAF’s parent company, says its proposed passenger rail service will deliver $6.4 billion in direct economic impact over eight years, 10,000 jobs a year during rail line construction and 5,000 jobs a year after construction is finished. Compare that with the marine industry, which accounts for 136,465 jobs annually in Broward, Palm Beach and Miami-Dade counties; more than $11.5 billion in annual gross economic output; and nearly $4.1 billion in annual wages and earnings. “We don’t think the failure to put together a transportation plan years ago should be allowed to now penalize an $11.5 billion industry that has invested heavily in itself and built itself into one of the major players in the South Florida economy,” Purcell says. • A study of future rail corridor capacity. Purcell does not think the marine industry needs to take the position that it must stop the rail plan. This article originally appeared in the January 2015 issue.